One of my biggest life goals is to travel through time. So far it’s not looking very promising as Marty McFly has yet to appear on a hoverboard and it’s already 2015. Often when you travel you, you get lucky. I wasn’t sure what I expected to find in Singapore, I was setback when I realized I had stepped into the early 20th century. 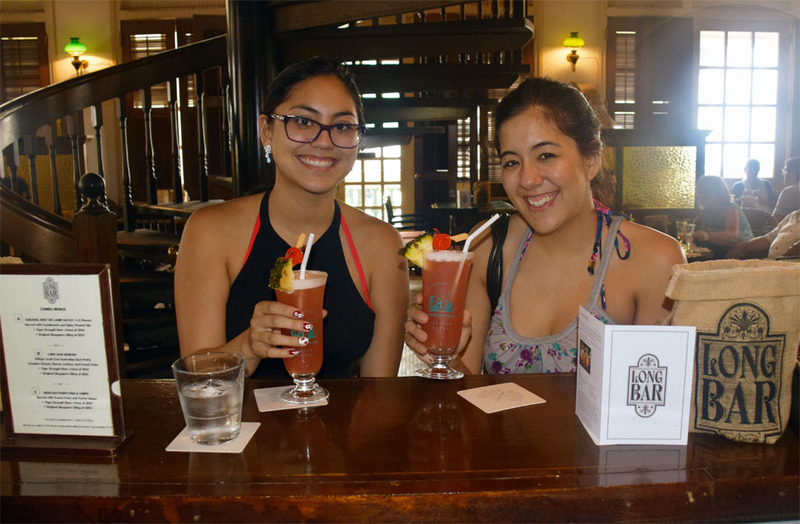 My sister and I wearing our casual and VERY 2000’s garb seemed out of place as we explored the refined Raffles Hotel. Singapore is a clean city. Remarkably clean. So walking into a bar littered with peanut shells was definitely a novelty. I can see why it would appeal to the many American tourists. Despite our appearance, we were warmly welcomed into the Long Bar by a smiling bartender. He handed us both menus, but we knew what we were here for. 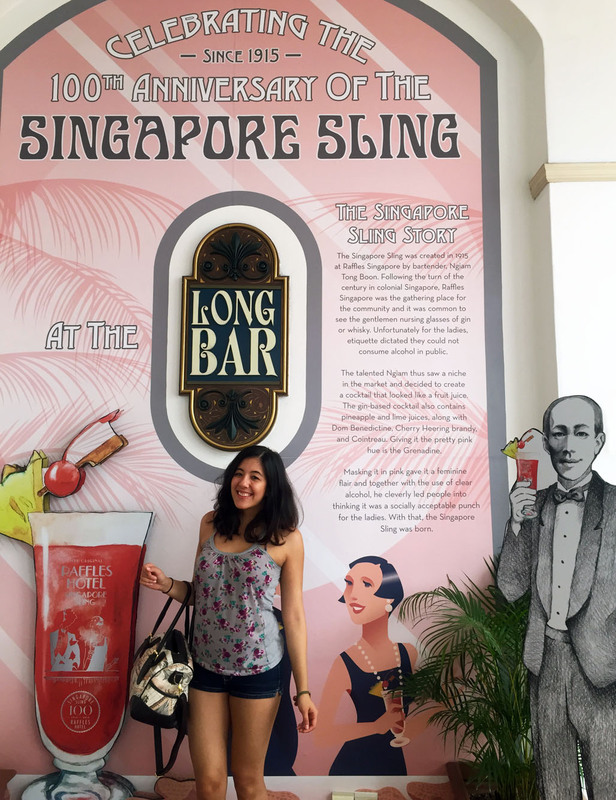 The world-famous Singapore Sling. Invented in the very bar we were sitting at, coincidentally exactly 100 years ago. For me, the Singapore Sling was quite sweet. I can’t imagine drinking more than one, nor could my wallet. But my little sister enjoyed the sling and slurped it up, happily enjoying the pineapple and cherry garnish at the end. It’s definitely a dangerous drink as you can hardly tell there’s alcohol in it. That is, until you stand up to leave and realize maybe you should have indulged in the shelled peanuts a bit more. I prove drinking cocktails is research by posing in front of an informational sign. 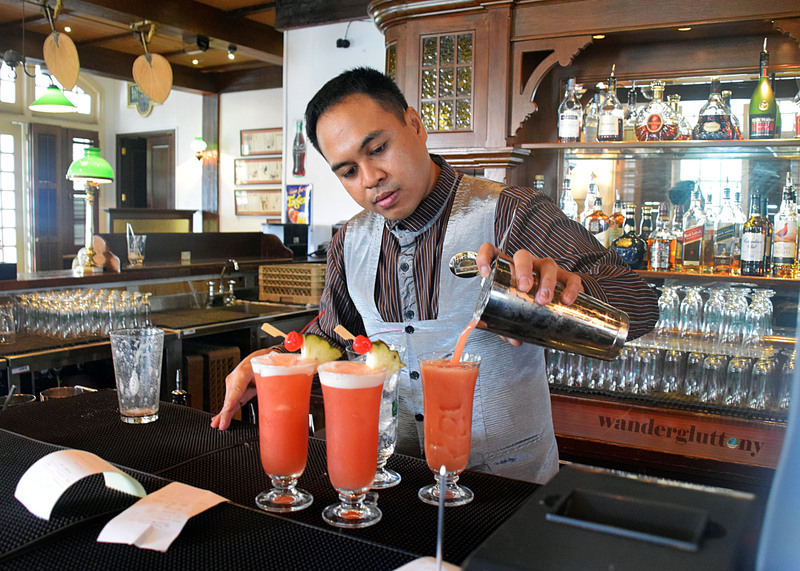 If a trip to the Raffles Hotel Singapore isn’t quite feasible for you now, don’t despair! You can try the “original”/current sling recipe. The recipe does call for some specialty liqueurs, so I’ve linked to a few other cocktails that use these ingredients. Thanks for sharing! It is great to hear about travels. I hope to visit some day! I hope you do too! It’s a beautiful city and very easy to get around. I typically don’t like sweet drinks like that, but I’d certainly be willing to give it a try. I also need to visit Singapore! Singapore is an amazing country too often overlooked by travelers. I highly recommend! i visited singapore when i was younger, definitely need to go back! great post! Thank you! Definitely! The city is constantly changing, I’ll bet you’d be surprised what you’d find. I absolutely loved Singapore! All the food I had there was fantastic and I had a Singapore sling with just about every meal LOL. Those cocktails look SO YUMMY. Awesome! Let me know how you like it. Remember to shake vigorously! It’s 3:00 AM in US right now and after seeing your drinks, I feel like having it..:D Nice post. I love hearing about travels. Great post.